Mr and Mrs Young are delighted they listened to Direct Kitchens when they were planning their new kitchen after completely changing the layout. Having lived in their beautiful home for 35 years, the Young’s decided it was time for a kitchen overhaul. 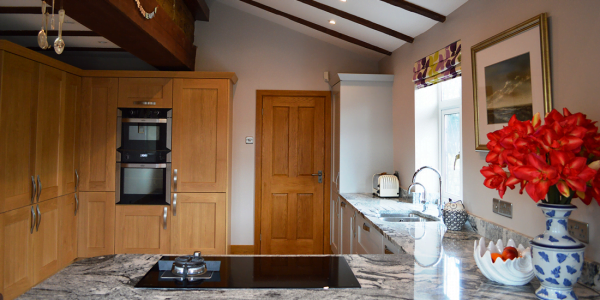 They contacted Direct Kitchens as they like to support local companies and they are now enjoying using their new open plan kitchen when the family visits. Once the design was approved, the plastering had been done, walls painted and flooring fitted the unit installation could commence in the large 14x20ft kitchen and literally took a matter of days. 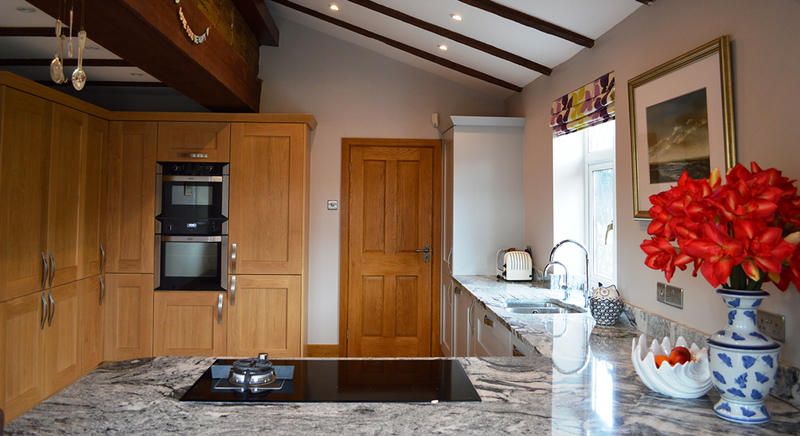 The family went for two different colour Rivington units to split the work station from the storage and the oak and light grey contrast works beautifully with the grey and black speckled granite worktops. The Young’s also went for an appliance package including: oven, hob, dishwasher, fridge, freezer and innovative hot tap – that they love! 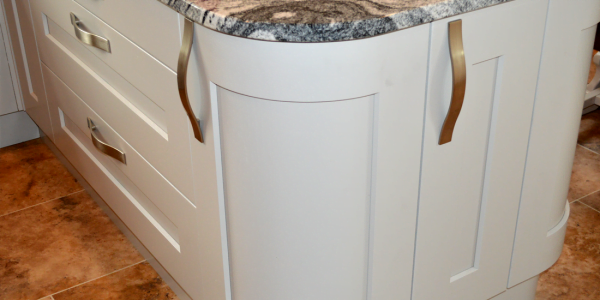 “We weren’t 100% on the inclusion of a hot tap and didn’t initially see the need for one, but wow – I absolutely love it, it is the best thing ever and very happy it was recommended to us. Being able to use a similar product in the Direct Kitchens showroom helped me see the benefits. 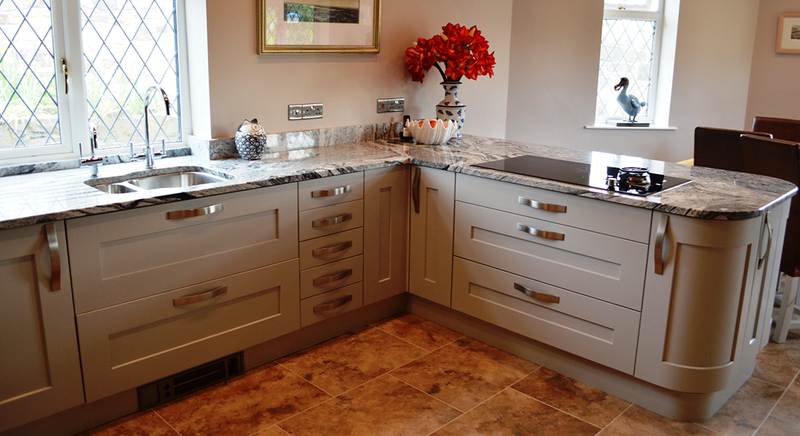 The rustic flooring and eye catching granite were installed by Karndean and Artisan respectively. 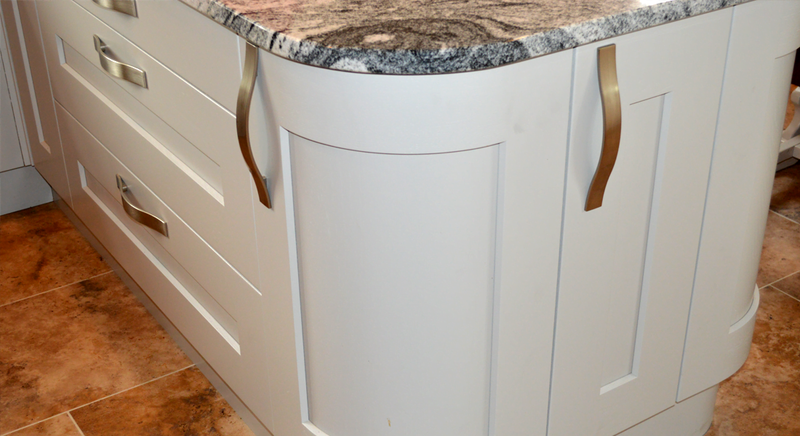 Products for both companies can be viewed in the Direct Kitchens Ecclesfield Showroom.